Regular Bleach powers through stains to keep whites brighter and household surfaces clean and disinfected. Regular Bleach removes 70% more stains than detergent alone and protects surfaces for easier cleaning. 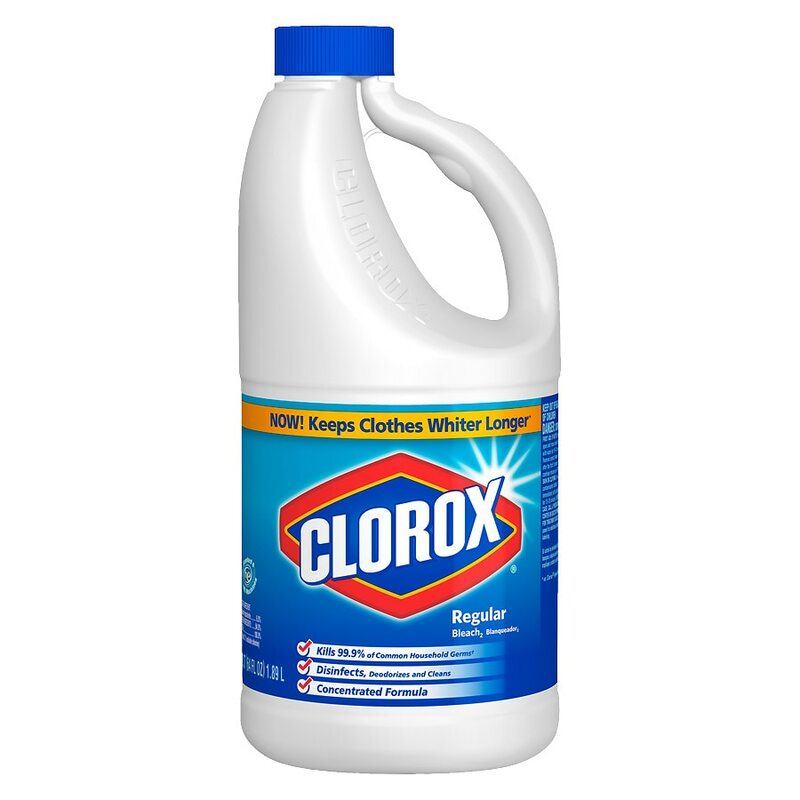 Clorox Bleach is the number one bleach of choice in America and is filtered three times to deliver the purest bleach. Remove tough laundry stains from white clothing, including grass, juice, dirt, wine and body fluid stains and disinfects countertops, floors, sinks and trash cans with confidence. It is safe to use around children, pets and pregnant women. Great for everyday cleaning and seasonal cleaning needs including spring cleaning, back to school and cold & flu season. Contains no phosphorus. **Staphylococcus aureus, salmonella enterica, rhinovirus type 37 and influenza A virus. It is a violation of Federal law to use this product in a manner inconsistent with its labeling. Do not use this product full strength for cleaning surfaces. Always dilute strictly in accordance with the directions. For prolonged use, wear gloves. For laundry: Bleachable fabrics: Avoid bleaching wool, silk, mohair, leather, spandex and nonfast colors. Whitening: 1/2 cup bleach + standard or HE washing machines. Sanitizing: 2/3 cup + standard washing machine. 1/3 cup + HE washing machine. Laundry sanitization organisms: bacteria: klebsiella pneumoniae, staphylococcus aureus. For disinfecting and deodorizing hard, nonporous surfaces: Floors, walls, vinyl, glazed tile, bathtubs, showers, sinks, hard, nonporous toys. 1/2 cup + 1 gallon of water. Pre-wash surface, mop or wipe with bleach solution. Allow solution to contact surface for at least 5 minutes. Rinse well and air dry. Storage and disposal: Store away from children. Reclose cap tightly after each use. Store this product upright in a cool, dry area, away from direct sunlight and heat to avoid deterioration. Do not contaminate food or feed by storage, disposal or cleaning of equipment. Product disposal: Product or rinsates that cannot be used must be diluted with water before disposal in a sanitary sewer. Container handling: Nonrefillable container. Do not reuse or refill this container. Recycle empty container or discard in trash. Corrosive. Causes irreversible eye damage and skin burns. Harmful if swallowed. Do not get in eyes, on skin or on clothing. Wear protective eyewear and rubber gloves when handling this product. Wash thoroughly with soap and water after handling and before eating, drinking, chewing gum, using tobacco or using the restroom. Avoid breathing vapors and use only in a well-ventilated area. First aid: If in eyes: Hold eye open and rinse slowly and gently with water for 15-20 minutes. Remove contact lenses, if present, after the first 5 minutes, then continue rinsing eye. Call a poison control center or doctor for treatment advice. If on skin or clothing: Take off contaminated clothing. Rinse skin immediately with plenty of water for 15-20 minutes. Call a poison control center or doctor for treatment advice. If swallowed: Have person sip a glassful of water if able to swallow. Do not induce vomiting unless told to do so by a poison control center or doctor. Do not give anything by mouth to an unconscious person. Note to physician: Probable mucosal damage may contraindicate the use of gastric lavage. Call a poison control center or doctor immediately for further treatment advice. Have product container or label with you when calling a poison control center or doctor, or going for treatment. Clorox Information Line: 1-800-292-2200. Physical or chemical hazards: Product contains a strong oxidizer. Always flush drains before and after use. Do not use or mix with other household chemicals, such as toilet bowl cleaners, rust removers, acids or products containing ammonia. To do so will release hazardous, irritating gases. Prolonged contact with metal may cause pitting or discoloration. Environmental hazards: This product is toxic to fish, aquatic invertebrates, oysters and shrimp.